If there is one inexpensive must have that is always in my medicine cabinet, it is definitely Vaseline. Vaseline isn't only for chapped lips anymore. This little magician in a pot works wonders on many things when it comes to beauty. Here's a list of all the handy ways that you can use Vaseline and why you should stock up on it now. 1. Dab a small amount around your hairline when dying your hair at home to prevent your forehead from drying out and getting stained. 2. Use a q-tip to apply a bit of Vaseline around the inside cap of your nail polish to prevent polish from sealing the cap shut and getting stuck. 3. Dab a touch of Vaseline on your neck and wrists before spritzing yourself with perfume, it makes the perfume's scent last longer! 4. Use Vaseline on cuticles to prevent them from drying and peeling. 5. Put a thin layer around your nail beds with a q-tip before painting your nails. The result? A no mess mani. Just wipe off the Vaseline when your nails are dry. 6. Chapped lips...no problem. Apply a bit of sugar to a touch of Vaseline and rub it in your lips. Next, wipe the Vaseline sugar combo off with a soft cloth for a soft lipstick ready pout. 7. Buff away rough dry skin by combining Vaseline and brown sugar. 8. No makeup remover? No problem! Dab some Vaseline on a soft cloth or tissue and gently swipe away eye makeup in a snap. 9. Using self tanner to keep a glow going this winter? Apply a dab of Vaseline to rough areas like elbows and knees to avoid streaks. 10. Are you a runner or into sports that cause you to be prone to chaffing? Apply a thin layer of Vaseline to areas that chafe easily like between thighs and the armpit area. What other uses do you have for Vaseline? i've done a couple of posts like these in the past. love the product. Isn't it great?! So many wonderful uses for it. Thanks! The perfume trick does work very well! 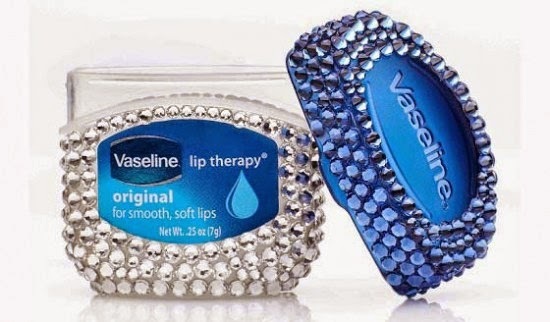 First of all, need that bejeweled vaseline our lives. and these tips are way too perfect!! It really is good for everything! Isn't it cute?! Thanks! I hope they come in handy. Thanks for the helpful tips. I'm definitely going to have to test these out! Number 2 and 3 are new to me, great ideas. I need to do the brown sugar scrub on my T-Zone it's gotten so dry and flaky this winter. Each tip works great. I hope they come in handy! when i dyed my hair at home i used it to stop getting dye all over my face lol. it's brilliant, isnt it?! Yes. Such a great and inexpensive item to have! Yes, so many great uses! This is awesome! I really only use it on my cuticles/super chapped lips so I can wait to try the other ideas! Why have I never thought of that nail polish hack???? That is genius! Vaseline is my jam! I LOVE it. I've had a few cases of severe skiing face burns and sleeping with it all over is the only thing that works. Love the tip about vaseline making perfume last longer! I use it for all kinds of things but I had no idea about that! It works great! Vaseline is up there on my list of must haves along with coconut oil! Ooh I'll have to try the perfume trick! I used to mix eyeshadow with Vaseline to create lipstick. The perfume trick seriously works so well. It really does make the scent last so much longer!